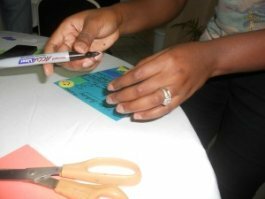 Baby shower activities involves the group as a whole celebrating the impending birth by engaging in meaningful tasks or projects without competing for prizes. Activities are usually a way to give mom something special or meaningful to do such as making a baby blanket. Normally activities at a baby shower are present at women only gatherings. The group usually has conversations centered around baby, pregnancy and parenting. It is a terrific way to give mom some well needed advice. You will find women seated around a large table where refreshment is close at hand so everyone can talk, eat and have a good time. 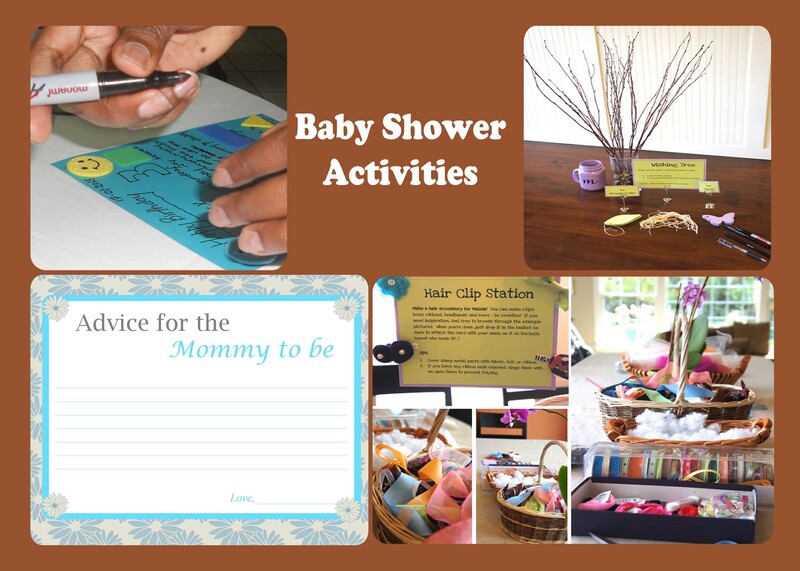 Baby shower Activities can be used at any baby shower. Use them as a substitute for games or even before games to set the pace for games to come. This is a popular activity for moms who want to have a scrapbook for their baby. This activity is especially helpful after the baby comes and mom has little time available to spend decorating pages. A fun alternative to baby scrapbooking is the baby shower Keepsake Book. A Baby shower keepsake book is the perfect baby shower activity that will make a unique keepsake of the baby shower for mom and baby. 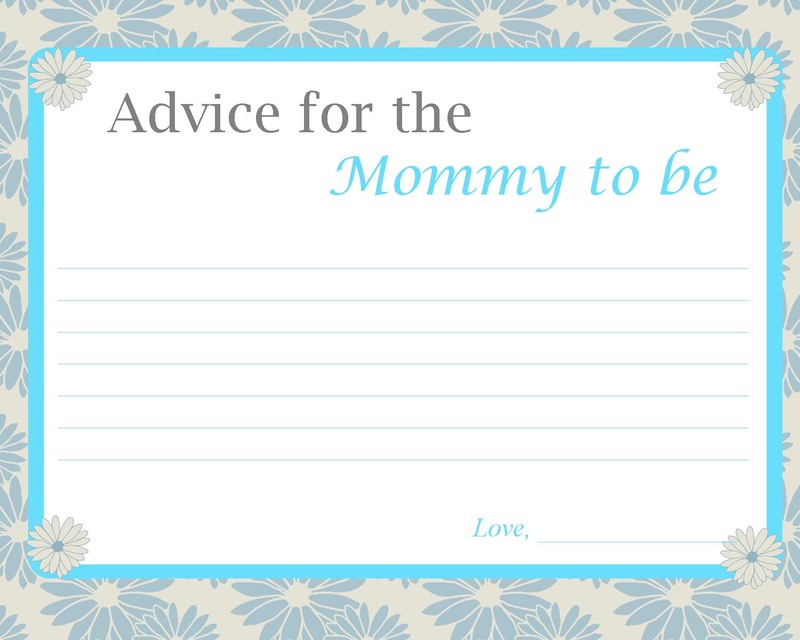 Baby shower advice cards are the coolest way to offer free and meaningful advice to the expectant mother. Each guest can offer helpful insight into what mom can expect in parenting. · Pampering mommy with foot massage, mani, pedis, facial body massage. Whatever you think the expectant mother and her friends would love. Create a wishing tree for mommy to admire in the nursery or other part of the house. make cards available with strings for persons to write their wish for the honored guest and her little blessing. Making sweaters and baby booties are not only popular at grandma showers but you can also make cute and creative baby gifts and crafts at the baby shower. · Decorate a onesie with cute little phrases such as "mommy's little girl." If this is not mommy's first go at pregnancy then you can also decorate onesies with phrases like "I am a little brother". Some women even make a baby blanket or decorate a portion of a blanket with pictures, poems, appliques, etc. Milestone Cards- Mommy will love the idea of milestone cards. Not only do they create great photo opportunities but serve as a reminder for the family to record special moments. They are easy to make and everyone can be as creative as they like. Baby Treasure Box-I like this idea because it is a way for the baby to see a glimpse into the past and for friends and family to show their love and support for mom and her baby. Guests can carry an item that has some meaning to them or something they think mom or the baby would benefit from. They can also make or decorate items to put in the box. Some items to consider are pictures, books, money, jewelry, etc. Mom-to-be can open the box to view its contents at her leisure or she can save it for when the baby is born to open it. Baby Video- make a video for mom and the baby. During the shower set up a camcorder/ video recorder in a room or anywhere that is convenient and tell them to give the mom-to-be some words of encouragement, a memorable story about mom that you would like to share with her or the baby. I am sure whatever you have to say will be appreciated by the honored guest. She can watch it after the baby is born when she is up late at night with feedings. The baby can even watch it when he/she is older and see what everyone was like back then and all the encouragement and love he or she was given before he or she was even born. It might be simpler to designate someone to be in charge recording the guests as not everyone is technology savvy. Decorate Nursery- helping mom to design or decorate the nursery especially in the case where dad is away. Some families build the baby shower around this baby shower activity. You will find that the friends and the whole family gather to paint the nursery and assemble baby furniture and share gifts with the new parents. If you are having a coed shower then let dad to be and the rest of the guys get a start on assembling cribs, slides etc. They will love being useful. A meaningful activity that will last years after the baby is born. Give each guest a blank card and non-toxic markers, paints, glitter or other art and decorative materials and tell them to make and decorate a birthday card for the baby 1 through to 18 years. If you have more than 18 people a good idea is to write the number on a piece of paper depending on the number of guests and let them pick a number from a bowl to see which card they will be making or instead of duplicating a year persons can write advice for the baby depending on the year that they received. Ask each guest to decorate a page for each month of the baby's first year. This is similar to a baby scrapbook but instead of attaching pictures and other baby memorabilia. 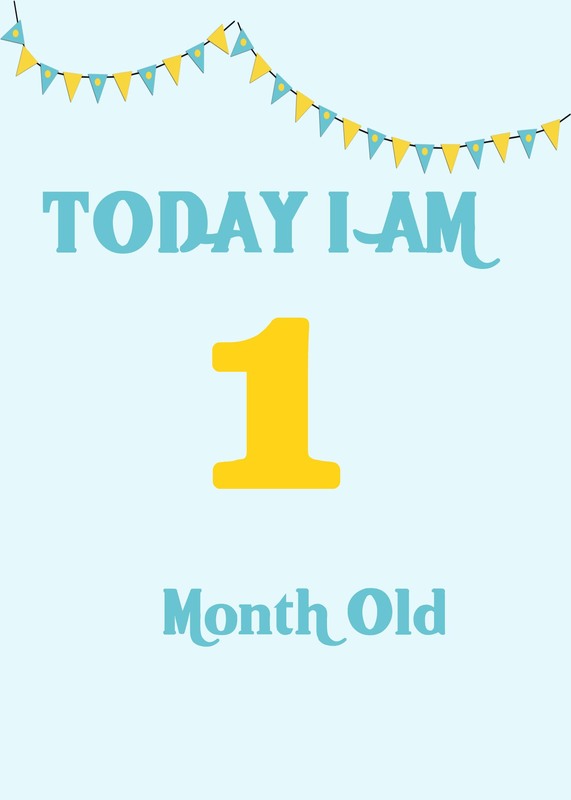 Mom-to-be can record everything of note that she wants to remember, in the baby's first year. She can also use it to keep baby appointments such as doctor visits, baby's first step and so on. 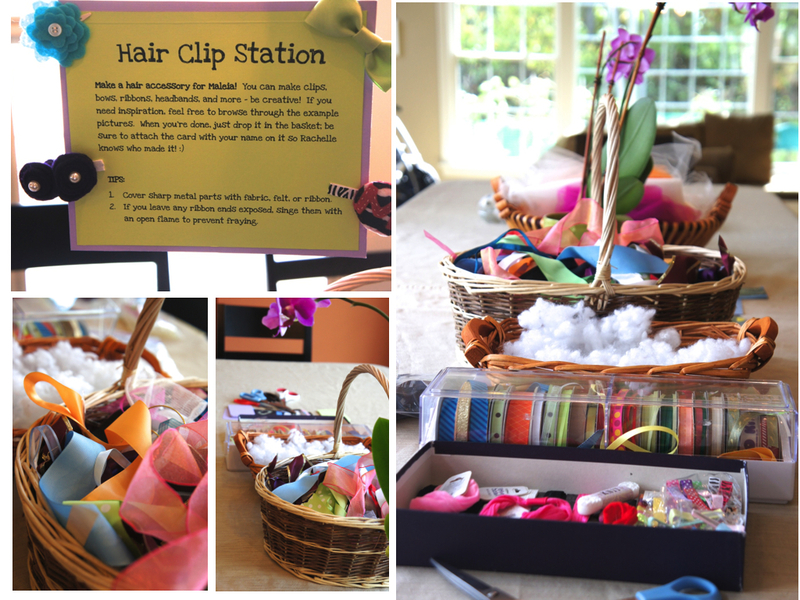 Baby Shower Hair Bow Station- if mommy is having a baby girl then why not make hair bows and clips? After all what little girl doesn’t wear them. Mommy would love them and they are super cute and pretty easy to do too. Quilting station- Have 6 inch fabric available or ask guests to take a piece of fabric with them to make a quilt for the baby.